Ornamental shrubs enhance a landscape with their textures and colours, season after season, and blueberries can work similar wonders in an edible landscape. Native to moist, acid soils in North America, various types of blueberries have been improved to the point where some type of blueberry can be grown in almost any garden. In addition to producing delicious berries that can make you healthier and smarter, blueberries look good in every season of the year. Spring flowers give way to clusters of purple berries in summer, and the leaves turn bright red in the fall. In late winter, the twigs often turn shades of red and purple, bringing subtle colour to a snow-covered garden. 2009 was a banner year for blueberries in the UK, where sales of locally-grown blueberries tripled due to an abundant supply. Most of the varieties grown in the UK bear pedigrees from public breeding stations in the US, for example early-bearing ‘Duke’ and cold-tolerant ‘Elliott’. These (and many other varieties) are called northern highbush blueberries, descended from strains that grow wild in the eastern mountains. This group of blueberries is generally rated as adapted in Zones 5 to 7, or where the lowest temperatures of winter range between 5°F(-15°C) and -20°F (-28°C). If you live in a colder climate, you can still grow great blueberries by looking to what are called "half high" or northern lowbush blueberries. Northern lowbush varieties like ‘Northland’ and ‘Patriot’ are not as productive as the highbush types, but they can withstand much colder temperatures, to about -40°F (-39°C). Heat tolerant blueberries for mild winter climates are easily found among rabbiteye blueberries, which produce bumper crops in Zones 7 to 9. In warm, humid climates, rabbiteye blueberries are often among the easiest fruits to grow organically. Assuming you have chosen compatible cultivars that suit your climate, it will be important to station them close to one another so that small pollinating insects will carry pollen between the bushes. Most cultivated varieties are self fertile, but pollination is often better (and the harvest season is longer) when two or three different varieties are grown. Plants spaced 3 feet (1 meter) apart in the garden will grow into a head-high hedge, or you can station two or three plants together in a sunny corner. Many varieties also can be grown in large containers, which is the best way to grow blueberries if you have neutral or alkaline soil. Blueberries cannot take up nutrients will unless the pH is quite acidic, below 5.5, so most gardeners need to amend planting soil with leaf mould, garden waste compost, or other acidic amendments to grow good blueberries. Light dustings of garden sulphur will also keep the pH down in the blueberry patch, as will acidic mulches like pine needles, rotted wood chips or sawdust. Blueberries also need plenty of moisture but not too much. They benefit from a generous surface mulch that keeps the shallow roots from running dry. Plan ahead to use soaker hoses or another efficient watering method to provide water to plants during droughts. Well-sited blueberry bushes can produce heavy crops for decades, but it often takes 3 years or more for young plants to start producing. To help them grow fast yet sturdy, most people pick off any fruit that is produced in the first two years after planting. With mature blueberries in your yard, your biggest challenge will be to wait until the fruits turn fully ripe to eat them. It’s hard to wait, but I find that the berries’ flavour improves for several days after the berries turn from green to dark blue. Most plants bear for at least a month, which gives us plenty of time to stash them in the freezer for making pies and preserves. In 2008 (a banner blueberry year in the US), we even made a small batch of blueberry wine. It’s pretty darn good! "Barbara, great information. Would you mind answering a few specific questions for me regarding growing blueberries in my area? I live in Northern California, 10 miles from the coast, South of San Francisco and North of Santa Cruz. I have good sun, get a frost between now and April and am surrounded by redwood forest. I wonder if redwood is a good mulch for blueberries? And when I plant my blueberries is it possible to add enough acid to the soil to successfully grow them? Which variety of blueberry would your recommend for my area? Thank you for your information. " "One of the tastiest things you can do with blueberries you've frozen is to blend them with low fat Greek yogurt. what you end up looks just like soft ice cream and so tasty you'd think you were eating something sinful!" "Emma, because of limited “chill hours” in your area (my guess is around 600), the best type of blueberry for you will be what are called southern highbush blueberries. These are hybrids between northern and southern types, and include varieties like ‘Misty’ and ‘O’Neal’. I do suggest growing them in large containers unless you have soil that tends toward being acidic naturally. Most redwoods grow in acid soil, so you may have a perfect setting for these fabulous fruits. Whether in pots or in the ground, I would not hesitate to mulch them with redwood needles or partially rotted redwood chips or sawdust. They will probably love it." "Great information! Blueberries are a superfood! " "Thank you, Barbara, for the depth of information in your blog. I have struggled for some time to access the temperature info for blueberries; no-one seemed to know, and here it is! How nice it is to have not just the basic stuff, but the extra information that gives a grower an edge and a better understanding of his/her craft. I'm looking forward to reading (and growing) more!" "On the contrary Northland and patriot are the most productive yielding up to 20 pounds each. By the way Patriot is classed as a Northern Highbush! Northland is the lowbush." "Hi Im trying to find out what are the needs for my bush, only a new plant, should I take off the fruit it has on it, does seem a shame. What type of acidic fertilizer do I need. Thankyou. Marilyn"
"Marilyn, I would suggest taking the fruit off a new plant if you have only just bought it - it will help the plant put its energy into establishing a good root system during the first year. You could always leave just a few on if you are desperate to have something from it. For acidic fertilizer use the suggestions in the article for mulches and adding good garden compost." "I have a blueberry bush that had flowers all over it, and now no fruit. What could be the problem? It is in a pot, doing much better than the ones I have in the ground. I planted all of them all last year. Should I be picking the fruit off the ones that are producing for another year so the can have stronger root system?" "Rita, I'm really not sure what would cause that. As you already have other blueberries elswhere in your garden pollination should be happening if insects are getting to it. Could the blueberry in the pot have become stressed due to lack of water at the critical stage of producing fruit?" "I have a question about planting blueberries in pots: how big does the pot need to be, and will the bush need transplanting as it grows? Also, will it need any special attention prior to winter? I live in southern Saskatchewan, Canada (zone 3)." 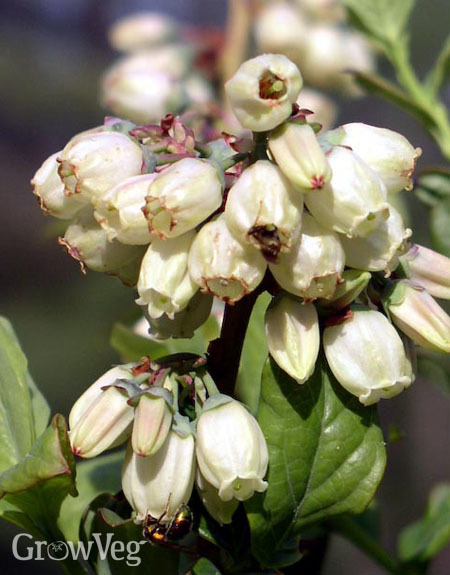 "Cecelia, the types of blueberries you can grow are smallish plants, but because of their extensive surface roots, they will be happy in pots for only a year or two. Your best option is to consider planting saskatoons in a special bed. They are not true blueberries, but they are a better fit for your climate. Canadian research has helped to develop superior saskatoon varieties, too. " "Hi Barbara! I love this blog and have found it to be such a resource to me over the last two years - thank you for all the information! I recently bought 5 3-year old blueberry plants that I'm transplanting into the garden. As they are still quite small, and are not using all the space between the plants, I wanted to plant some other vegetables or herbs between them. Do you have any suggestions for good companions for blueberries? My soil currently is about a 6 PH, but I am hoping to bring that down to a 4.5 or 5 by adding peat moss before planting the blueberries. Thanks again!" "I use a deep sawdust mulch for my blueberries, and strawberries seem to like it very well. I tried some alpines and they would have willingly formed a ground cover. When I decided to get rid of them, they were easy to remove without disturbing the surface roots of the blueberries. Now I am cultivating June-bearing strawberries as a broad edging on one side of the blueberry patch. Strawberries are supposed to need a higher pH than the blues, but they don't read the books. " "Barbara, Your info has answered all my questions. I couldn't figure out why they weren't blooming. I had done all the proper preparation. I just needed to WAIT. I'm a new subscriber. At three this year, maybe we'll have babies. Also have two yearlings. Thanks and God bless." "Hi Barbara. We planted 6 blueberries a few years ago, but the birds have taken every berry! How do you prevent the birds from getting all of the berries? I know they can be covered with cages or nets, but I'd like to avoid that if possible. " "I have not had good experiences with bird netting, because robins will get up under it and hop up to eat berries, but worst of all, hummingbirds get stuck in it. Instead, I use big pieces of tulle (wedding net), which can be fastened around blueberry plants with clothespins, like big puffy bonnets. They are easy to detatch for picking, too, and the birds can come behind and pick up the dropped berries." "Thanks, Barbara! I'll try the tulle. Sounds easier and safer than bird netting. " "My blueberries range between four and six years old, but they hardly grow and are becoming less productive of fruit. The leaves also turn yellow and drop off by the end of July (I live in zone 4 western MA). I have done research and it seems I either have a nutrient isse or the disease "blueberry stunt". How do I know the difference/what action to take?" "Julie, first do a pH test to make sure your plants are in acidic soil. Fertilize them now with a balanced organic fertilizer and then mulch with bark or sawdust at least three inches deep. You must convince your berries that they are growing in an open place in the woods, with lots of natural mulch. " "I live in southern Saskatchewan...zone 3 I believe. I have been given vaccinium triple berry blueberry plants. Two...I can't find any info on this type. It does say hardy zone 4. If I put it in the ground where snow piles up a d cover top growth with Styrofoam will the bushes blossom and produce or after enough frost hours could I bring them in to our sunporch before it gets very cold. Don't want to loose them..they look like three to four year old plants..potted. Any suggestions would be great." "Wendy, the challenge is getting the buds on the branches to survive winter, because blueberries produce from buds on old wood. You might do better with saskatoons (Amelanchier) which are native to your area. " "Yes I realize that. I have many many Saskatoon bushes in our yard. I want to try to make the blueberries survive as they are a totally different fruit taste wise. I know the buds have to survive and so am wondering the best way to try to keep them overwinter. Thank-you for your response." "The usual strategy is to go with super-hardy Northblue or St. Cloud, which are low-growing bushes that become covered with snow. I would look at any of the varieties developed in Minnesota and Michigan: http://www.extension.umn.edu/garden/fruit-vegetable/blueberry-production-in-mn/"
"I use car tires with the sidewalls cut out. Placed them around the bushes and filled with mulch to the top. Works great!"